The other major development was the site selection at Art-o-Matic. KT and I got there on Sunday and picked through the scraps that the other artists had left from Saturday. I think we did pretty well, we got the first room when you turn right from the info desk on the 6th floor (the room number is 6T17, in the red section) I have one roommate, who's phone number on his card is not connected...so I have yet to coordinate with him about what part of the room is his vs. mine. One of the things I need to do for Hukilau is send some of my promotional materials to them for their website. They specifically asked for a logo, so I have been kicking around making a new logo in conjunction with a new business card. Let me know what you think. All that's left now is to show you my schoolwork. 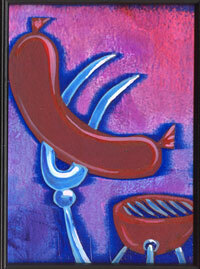 14 Paintings was a another day of figurative abstraction, this time centering on line. We started a discussion on Brice Marden in class (actually Steven was kinda dissing him) so I ended up trying to make a similar sort of painting. I really just wound up doodling with the paint...which is where I don't like to be when I am making abstract work...I don't think that this a very good painting in the end. Next week I will have photos of this Sunday's Lobsterboy's Ship-o-Fools @ the Birchmere! The strategy I think I am going to employ for the painting I will be doing for the upcoming shows is based on the idea that I need to be channeled...like a mighty river (hey, its my narcissistic blog, I'll be as hyperbolic as I wanna be!) So I have set forth to create a set of six "thesis" paintings. That is, six totally different paintings (thematically) and then pursue further paintings from the most successful of those original six...So if you want to get a glimpse of the headwaters of the mighty stream of consciousness that is Artbyjared, you'll have to swing by my booth (or wall, or room or whatever is left for me to claim) at Art-o-Matic! For St. Patty's day, KT, Jared R, Mark, Amy and Sara all made our debut (in attendance) to Blobs Park. Brave Combo was playing...and we did the chicken dance. Nuf Said. Lastly, I am happy to report that I have classwork to show you, since I did not have jury duty, nor was it any sort of holiday. 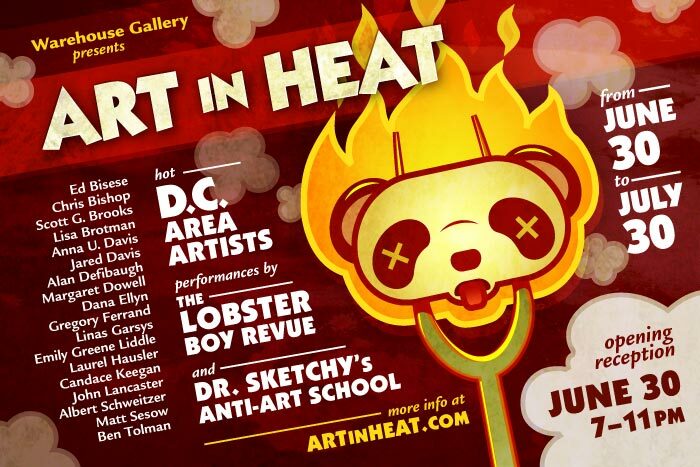 I don't know how this has slipped my mind, but the official "pre-marketing" campaign has started for Art in Heat. Which means you should be on the lookout for this postcard EVERYWHERE! In the course of events, I also ordered two more segments of Pipe and Drape, so that I can A) use them for scenery for Lobsterboy's Ship of Fools, and B) use them as my "booth" at Hukilau! servitude) for Art-o-And lastly, I got in line (and paid my money, and signed up for my 15 hours of indenturedMatic! So check back here soon for concurrent posts about Lobsterboy's Ship of Fools at the Birchmere on Sunday April 1, and the Opening of Art-o-Matic on Friday April 13! I hope that BtT wont get banned in Iran for this! The older writers in Hexagon are a bit paranoid about Blackberrys...then again, how do you make fun of a mayor who has been in office for only a month! Because of Anna Nicole Smith, this has become "old news"...I still think its funny...BTW, she is being propelled by a can of "pepper spray"! And here it is during dry tech. The arch is up and lit (the little lights even chase), the spotlight operators are inside, and you can see three of the five carts in this picture. The other GINORMOUS event that happened was Tug of War at Hemphill. All of the big lowbrow folks were included in the show (I got to meet Glenn Barr!) and that of course includes Scott Brooks. If you missed the opening, then you missed the opportunity to buy Scott's work...snooze you loose! Lastly, the other project I have been working on is being the scenic painter for Rep Stage's production of Bach at Leipzig. It is a "Milagros..." designed set, so there is plenty of painting to do. I spent the better part of three days painting faux marble for the floor!